Next Urban Sketches WORKSHOP – INDOOR! Meeting Point: 2:00 pm : front the Info point (Ground Floor. ), on the middle of the shopping center “Potsdamer Platz Arkaden”. I ‘ll wearing a blue scarf. 1) A medium sized / larger sketchbook or a block papers. 5) A portable stool if you like, to sit on while working. Don’t worry, if you don’t have the material, I’ll although bring some for you too. 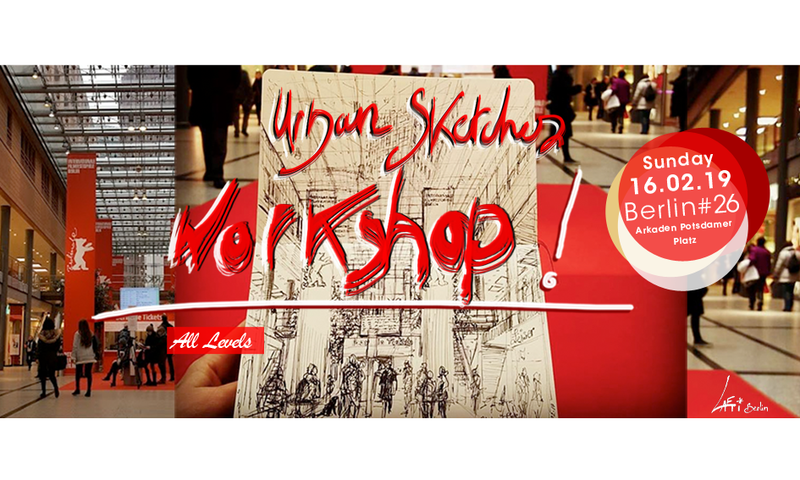 I have the pleasure to invite you: to my next Urban Sketches WORKSHOP in Berlin #26- INDOOR! MEETING POINT: 2:00 pm : front the Infopoint (Ground Floor. ), on the middle of the shopping center “Potsdamer Platz Arkaden”. I ‘ll wearing a blue scarf. Please be punctual. Thank you! 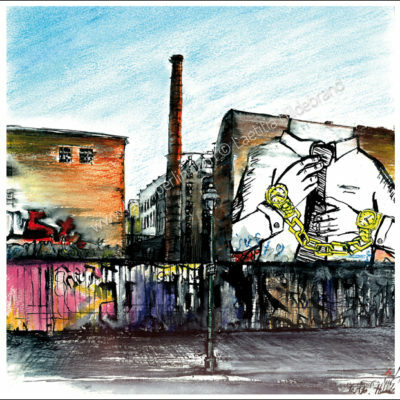 We will see together basic rules of the perspective with some composition notions. This place is really interesting to observe, through the huge windows of the shopping center. Inside, we can appreciate the nice decoration and the special atmosphere of the international film festival, the “Berlinale”. 1) A medium sized / larger sketchbook* or a block papers. 2) pencils: HB and/or between B and 8B 3) One or two different kinds of pens for making marks: a fountain pen, or a brushpen or any other kind of pen with waterproof ink 4) maybe a small brush 5) A portable stool if you like, to sit on while working. Don’t worry, if you don’t have the material, I’ll although bring some for you too. 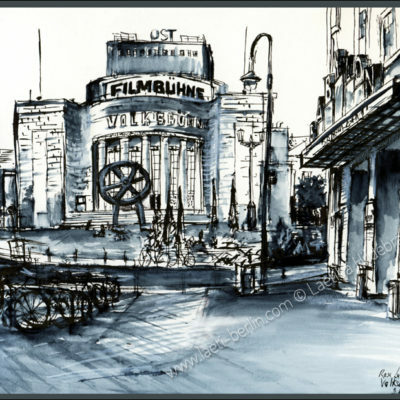 *It’s important to see the evolution of your drawing and your observation in the same book. – Price: 18 Euros per person. This workshop will not take place with less than 3 participants. TREFFPUNKT: 14:00 Uhr : Vorm Infopoint (E.G. ), an der Mitte vom Einkaufzentrum “Potsdamer Platz Arkaden”. Ich werde einer blauen Schal tragen. PROGRAMM: Wir werden zusammen über die verschiedenen Perspektive Regeln mit Grundlagen arbeiten. Dieser Platz ist sehr interessant durch die Fenstern vom Einkaufzentrum zu beobachten. Drin können wir die schöbe Dekoration und das speziales Ambiente vom Internationales Filmsfestival, die “Berlinale”, geniessen. 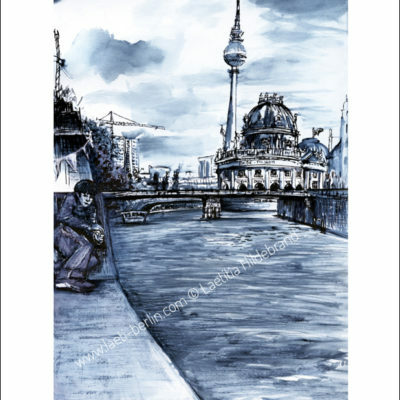 MATERIAL: (muß man nicht alles haben) – Dein eigenes Skizzenbuch * – welche Bleistifte, Fine-liner und/oder Stifte, Radiergummi, Pinseln, Wasser & Becher – Für alle Fälle werde ich auch Materialen mitbringen! *Es ist wichtig, die Entwicklung Deiner Zeichnung und Deiner Beobachtung im gleichen Buch zu sehen. – Preise: 18 euros pro Person. – Teilnahme minimum: 3 pers. Wenn weniger Teilnehmern, wird der Workshop abgsesagt. RENDEZ-VOUS:14h00 – : devant le point d’Information (R.d.C) au centre du grand hall du centre commercial “Potsdamer Platz Arkaden”. Je porterai une écharpe bleue. Lors de cette séance nous étudierons ensemble la composition ainsi que quelques règles basiques de perspective. Dans ce bâtiment nous resterons au chaud. De plus, grâce aux grandes baies vitrées nous pourrons contempler les grattes ciels de ce business center berlinois. 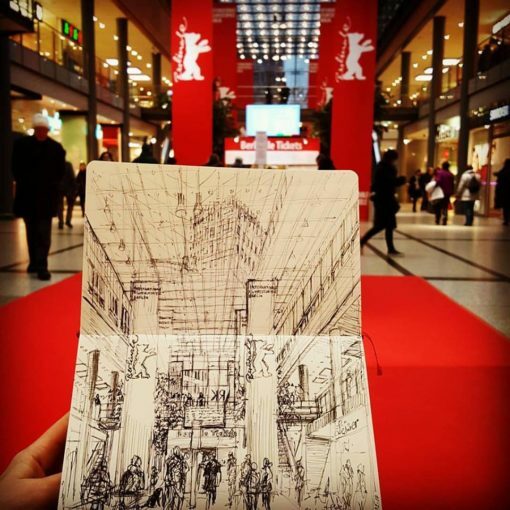 En effet ce lieu impressionnant est intéressant à observer avec son architecture moderne et l’ambiance de la Berlinale, festival international de film. 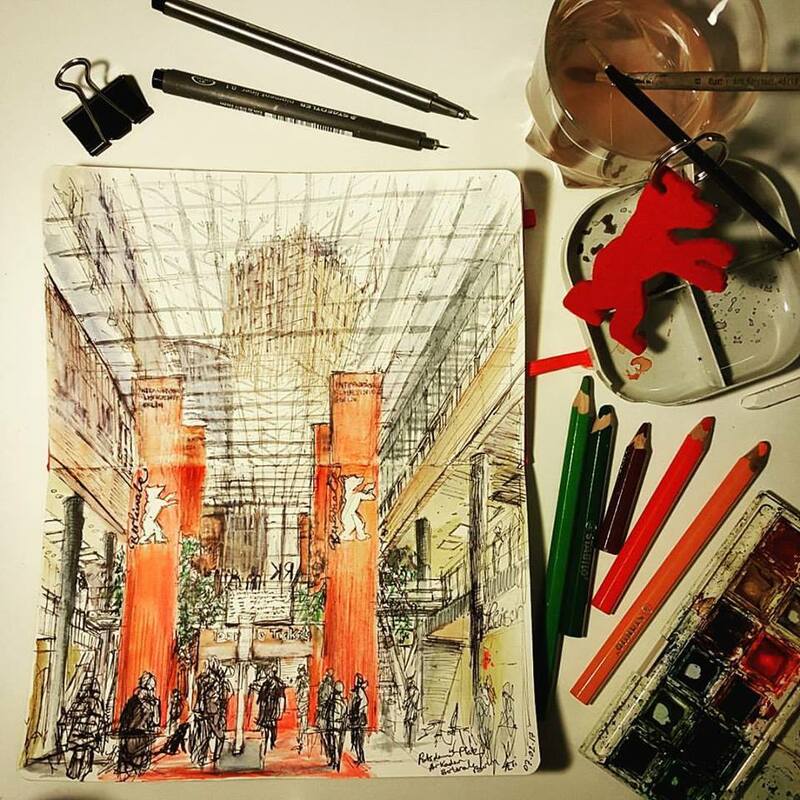 Apportez SVP votre propre carnet de croquis* + quelque stylos, et/ou feutres, et/ou fine liner, et/ou crayons et/ou pinceaux, et si possible gomme. Je ramènerai aussi du matériel en cas d’oubli. * Il est important de pouvoir observer l’évolution de vos croquis dans un même carnet. – Prix: 18 euros par personne. – Capacité: minimum 3 personnes. Si la totalité des participations passe en dessous de 3, la séance sera annulée.